The Sarapiqui River in Costa Rica is better known as Rio Sarapiqui. A tributary of the famous San Juan River, this water body moves through the moist tropical rainforests and dense jungles of this lovely South American country. The free-flowing brook initiates its journey from the mountain ranges and then heads through thick rainforests. 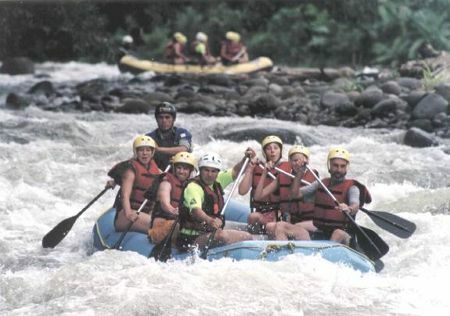 The spectacular whitewater of the Sarapiqui River looks really awesome, as the water body moves amidst lush vegetation and vibrant landscapes. As the crystal waters tumble down and form foaming waves, the water body stands to offer the best condition for a rafter to enjoy. As the clear and pristine waters of the Sarapiqui River bring in rapids of class II, the rafters come across quite easy hurdles to overcome. Further in its course, you may need to battle through tumultuous waves too that will make your pulse-rate soaring! Meandering through the thick forest, the river makes you encounter the wonderful natural beauty of South America. The vicinity of the river is indeed fascinating, as teamed with the wonderful greenery come to the lush wildlife as well. What’s more, a rafting trip on the Sarapiqui River will help you get a view of hummingbirds, toucans, woodpeckers and birds of several other sorts. Leaving the surroundings of the verdant forests, the waterway moves through narrow Costa Rican gateways. Ideal for novices and family trips, the Sarapiqui River is characterized by its tranquil stretches. Once on a rafting trip on the river, you are bound to get enthralled by the sun-basked river banks! Now, as you plan to spend your weekend in one of the most magnificent locations in the world, you can surely make a trip to the Sarapiqui River. So, get prepared for a rollicking rafting adventure!